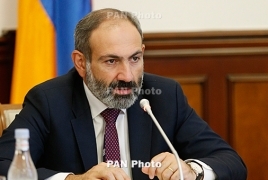 PanARMENIAN.Net - Prime Minister Nikol Pashinyan said on Friday, August 10 that everyone, including "our partners in Russia", should get used to the new situation in Armenia. At a briefing with reporters on Friday, Pashinyan was asked about Russian Foreign Minister Sergey Lavrov's comments about the recent developments in Armenia. "Everything is normal," said Pashinyan. Armenia is currently investigating a 10-year-old case on clashes between the police and protesters that followed the presidential election of 2008. Former President Robert Kocharyan is currently under custody, while CSTO Secretary General Yuri Khachaturov was released on bail. Lavrov said earlier that the Russian side has repeatedly raised the issue to the Armenian leadership.